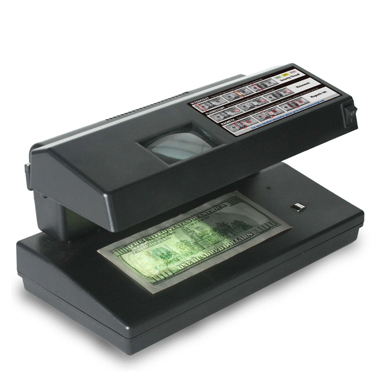 The 4-way counterfeit detector easily detects fake bills and ID cards. Complete with a magnetic sensor, watermark verification window, micro-print magnifier and ultraviolet (UV) bulbs used for counterfeit detection. There are at least 13 items that can now be verified using UV lights including; Drivers Licenses, Passports, all major credit cards, travelers checks, US birth certificates and more! Compact and portable. One year limited warranty. 110v power adapter.